Visiting Mount Rainier for the final time last month was the perfect way to wrap up my Class of 2018 Britt Key Team Model shoots. I have to admit that I was exhausted the morning of Shaniah's shoot, but a bit of strong coffee on the way to Daniel Ross Salon for hair and I perked up like a dry flower in a rain shower. Weather still awry, we opted for a sweet side braid. Braids are really in right now, and I love that they're a timeless style. Shaniah's shoot was nearly pouring almost the entire time. While I do typically reschedule rainy shoots, you may find that you like the rainy look! 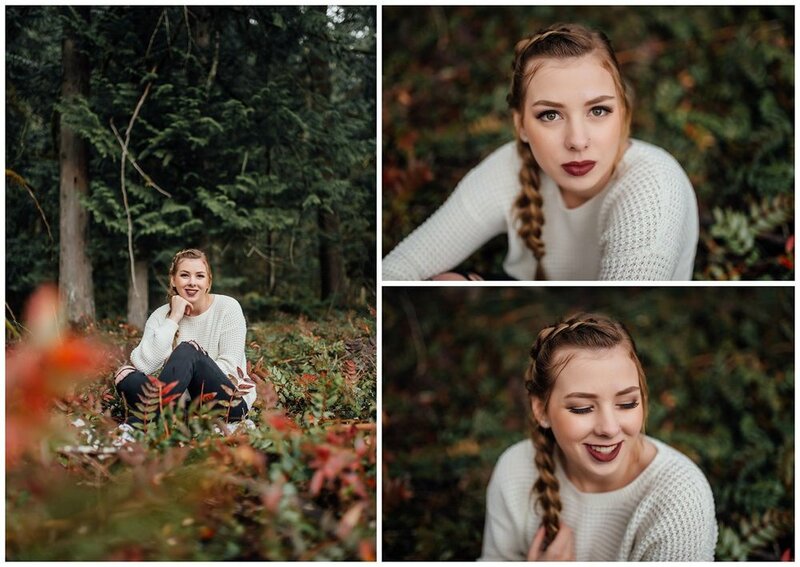 It's not the most comfortable weather to be out in, but honestly.. you can't get any more "Pacific Northwest" than a senior session in the rain. Drops of rain can be seen in the frames, as well as, clouds and mist lingering in the hills creating that sought after PNW vibe. I'm game for a rain shoot if you are, but there are a few things to keep in mind. Bring an umbrella. This seems obvious- but many of us in the PNW seem to tough it out so often, we can never find our umbrellas. Bring another coat to wear in between shots so you're not getting your shoot outfit completely drenched. Grab a hand towel for blotting your face and hands if they get wet. Know that the rain makes everything wet and will limit sitting poses. We either won't be able to do them for fear of getting wet, we can have you try and sit on something that we can hide, or you just own it and get a little wet. Lighter clothing colors and really dark colors do not show wet material as obviously, however, don't put yourself in a situation of a thin shirt that becomes see through. Wear thick socks and waterproof shoes to keep your feet dry. Wellies are an easy peasy no brainier. Wear a brimmed hat. Brimmed hats are really in style right now and will protect your face and a good portion of your hair. I typically wear one when I'm shooting on a rainy day. Bring warm drinks in a thermos or scope out the coffee stands in the area to grab something to warm you up when the shoot is over. Coffee, coffee, coffee. Don't try to dress like it's not a rainy moody day. While you can get away with not wearing a jacket in every photo, don't wear a sun dress and sandals. It'll j ust end up looking kind of silly. If you choose to keep your shoot on a rainy day, just own it and love it. Scroll down to see Shaniah's rainy Mount Rainier shoot! If you're interested in a session at Mount Rainier, I'd love to work with you! Visit the "About" page to contact me, or take a gander through the "Investment" page for more information. Brittingham Photography specializes in natural High School Senior portraits, but also offers Britt Beauty Sessions (individual women's shoots), Lifestyle Newborn, and family photos. Thank you for stopping by to read my little blog!